My heart ... soul is with France, Paris, art lovers worldwide. I was devastated as video began to come in yesterday of Notre Dame in flames. 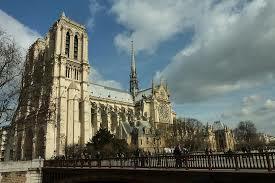 You are not alone in your grief from the lost of such an extraordinary cathedral. It will live in our hearts, today, tomorrow, next month, and years to come, a continued symbol of France's remarkable heritage.